It’s Finally Friday! 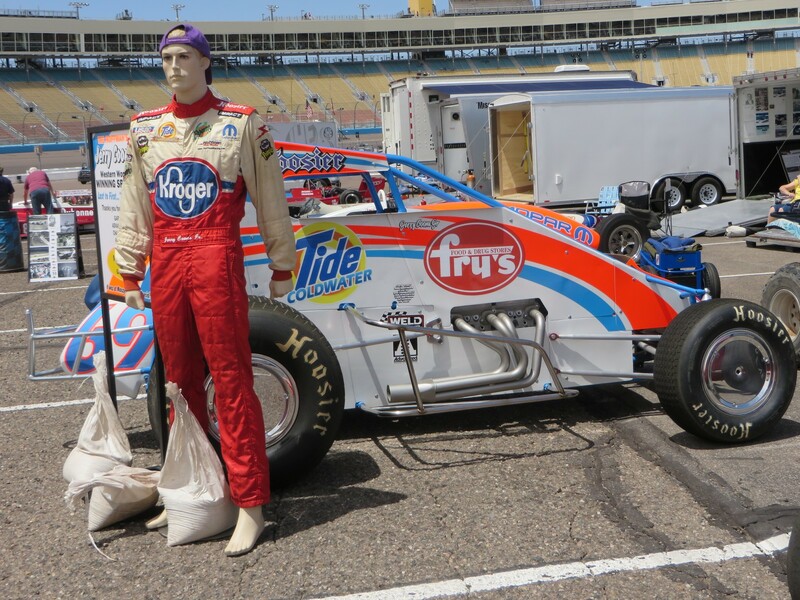 Day One of a low-key two-day Verizon IndyCar race weekend at Phoenix International Weekend. The schedule is about as different from the Toyota Grand Prix of Long Beach as can be. There are two other groups of cars on the schedule this weekend, with generous breaks in between sessions. And there will be autograph sessions for all three groups. The weather is warm – low to high eighties, with the breeze alternating between desultory and brisk. the morning heavy overcast long gone. The feature for the Desert Diamond West Valley Phoenix Grand Prix is Round Four of the sixteen weekend IndyCar schedule. 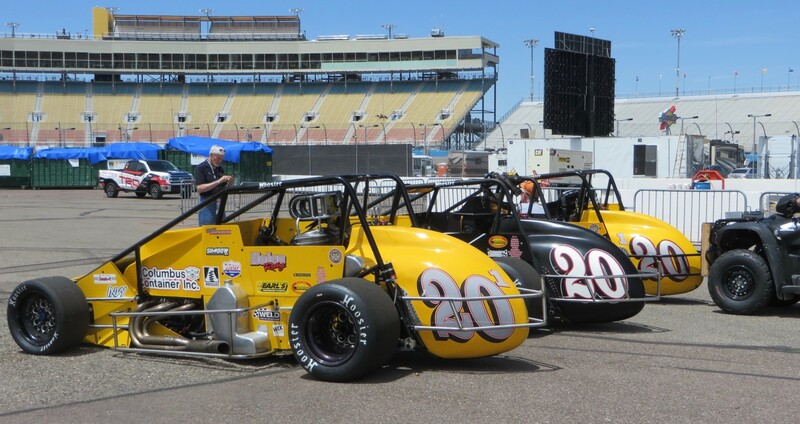 Also this weekend are the USAC Silver Crown Champ Cars with 17 drivers, and Quarter Midgets running outside the grandstands; and the Vintage Desert Classics, which are IndyCar Legends car – 43 of them on display and mostly on track. 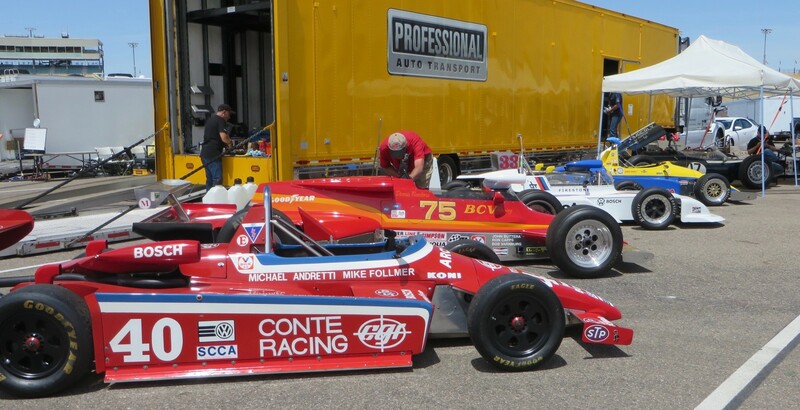 And from those 43 are two which will have a ‘shootout’ of sorts, called the Speed Calibration, which will pit former IndyCar driver Dennis Firestone in one of his old race cars, and Desert Classics promotor, Gary Mondschein. 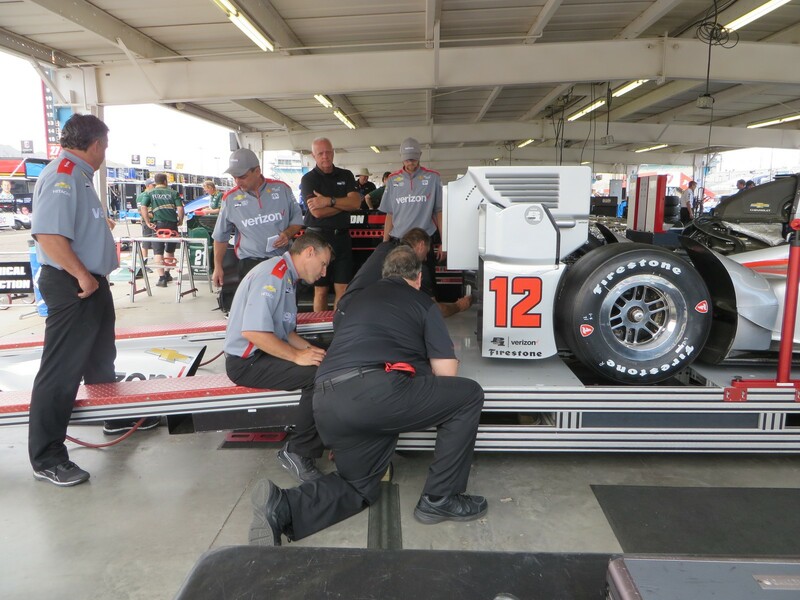 The IndyCar garage is relatively quiet and going about its business, with teams picking up tires, prepping cars, going through Scrutineering, and setting up Pit Boxes in the very wide Pit Lane. Quite a contrast from the narrow street-circuit pits of Long Beach. Take a good look at the front straight grandstands, the RV lots and the garages. They are on their way out. The track is undergoing a massive renovation, which will take two years to complete. 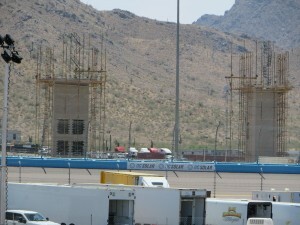 After this weekend’s race, the garages and front straight grandstands go. Everything which was there will be moved 90 degrees to the left. The Start-Finish Line will move to the left. The infield will be a new fan zone area. New garages will go up where was the RV lot – three covered garage areas. The Bobby allison Grandstand benches will be upgraded to individual wider seats, with cup holders. Access in the grandstands will be via four new escalators and five new elevators in addition to the five existing elevators. Structures for two elevators are under construction already. 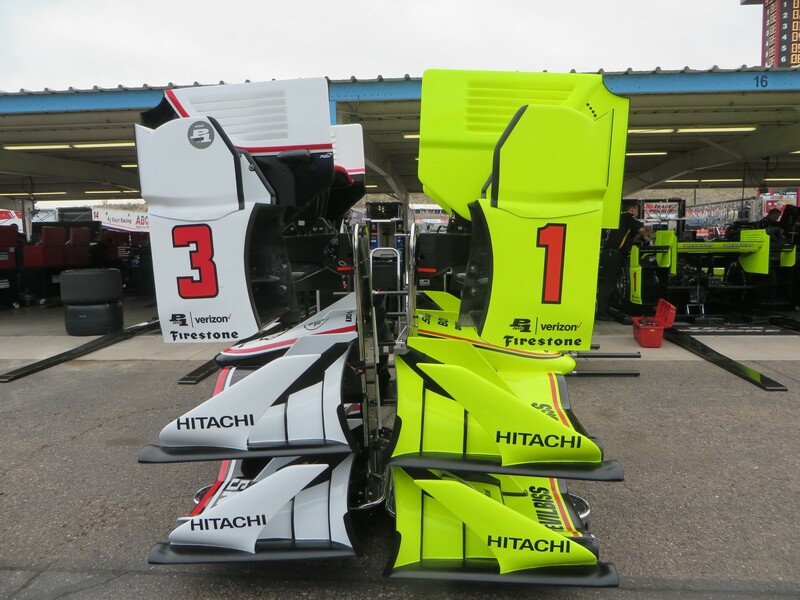 And something dear to the heart of all race fans – multiple new restrooms, including ADA facilities. Capacity will be 45,000. There will be a new Media Center and buildings to accommodate Race Control, Timing & Scoring, Medical Center which will house a new First Aid station and EMS location, and Guest Services Area. New concession areas are coming. 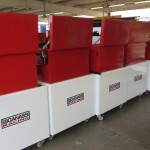 The DC Solar Fan Midway will provide more visual fan access to the Drivers, in their meetings, for autograph sessions, of the garages, and of the Gatorade Victory Lane celebrations. There’s a lot of work scheduled between now and the November NASCAR race. The Silver Crowns had a practice in the early afternoon, and points leader Chris Windom in No.92 Gene Kazmark/Remin Kat-A-Bag-Project Healing Waters/Beast Ford. blew an engine. The car has been withdrawn, but as Kody Swanson said – “Just because Chris doesn’t have a car, don’t count him out.” Kody is tied for second in the current standings, in No.63 DePalma Motorsports/Radio Hospital-Hampshire Racing Engines/Beast/Hampshire. In Qualifying, fastest was Bobby Santos/No.22 DJRacing-Simpson Race Products/Beast/VDS Chevy. Second was Kody Swanson, and third was veteran Davey Hamilton (Sr) in No.99 RPM-Fred Gormly/Guts Wear-Hoosier Tire/Beast/Chevy. They all agreed that the wind wasn’t a problem for their cars, described by Hamilton as “a brick.” To a T, all the USAC drivers are thrilled to be back racing at PIR, so much so that Kody Swanson’s brother, Tanner Swanson, went looking for a ride and he’s in No.201 Gene Nolen Racing/KECO Coatings/Beast/Tranter Chevy. 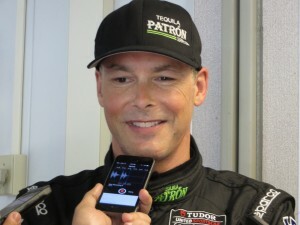 JOHANNES van OVERBEEK/No.2 Extreme Speed Motorsports HPD ARX-03b is on pole for Sunday afternoon’s Continental Tire Monterey Grand Prix at Mazda Raceway Laguna Seca for the TUDOR United SportsCar Championship. His lap was 1:18.970. Van Overbeck was also fastest in the second Tudor Championship practice session just prior to qualifying. Van Overbeek, from nearby Oakland, has an annual tradition of bike riding to the track for the race. This year he took a circuitous route from San Jose, through the hills of Morgan Hill, Mount Madonna, Elkhorn Slough, Castroville and onto the track. He had a gang, including five of his ESM crew, two from his former Flying Lizards crew, and some friends. It must have done the trick. All four class pole sitters set new qualifying track records. 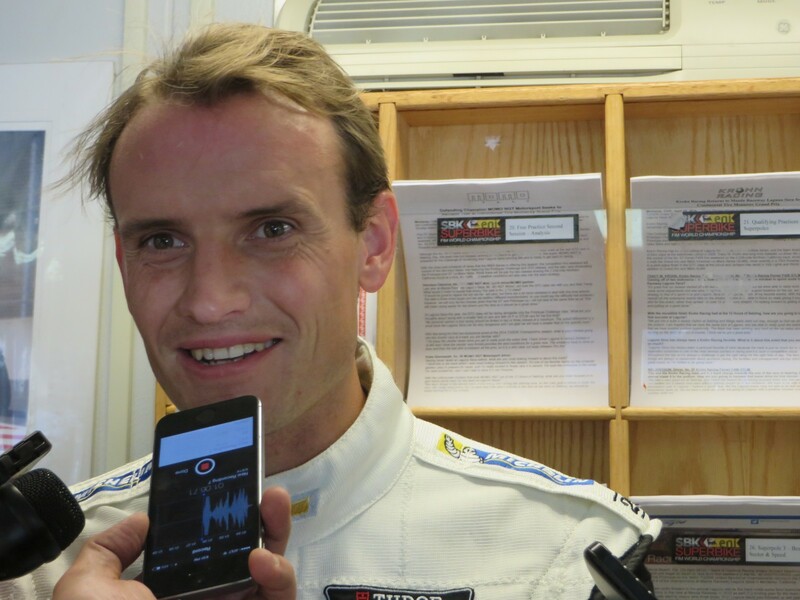 Van Overbeek didn’t think traffic would be too much of a problem with the GTLM cars in Sunday’s two-hour race. The two groups race well together. 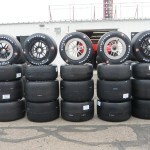 The Prototype class fairly growled as they accelerated out of the Pit Lane onto the 2.238-mile road course. The temperature was a brisk 63 degrees. Second and third in the Prototypes were RICHARD WESTBROOK/No.90 Spirit of Daytona Corvette DP Chevrolet with co-driver MICHAEL VALIENTE, and RYAN DALZIEL/No.1 Extreme Speed Motorsports HPD ARX-03b, teamed with SCOTT SHARP, who led early on. BRUNO JUNQUEIRA/No.09 RSR Racing ORECA FLM09 Chevrolet/Continental took pole for the PC class. His lap was 1:19.723. His co-driver is DUNCAN ENDE. 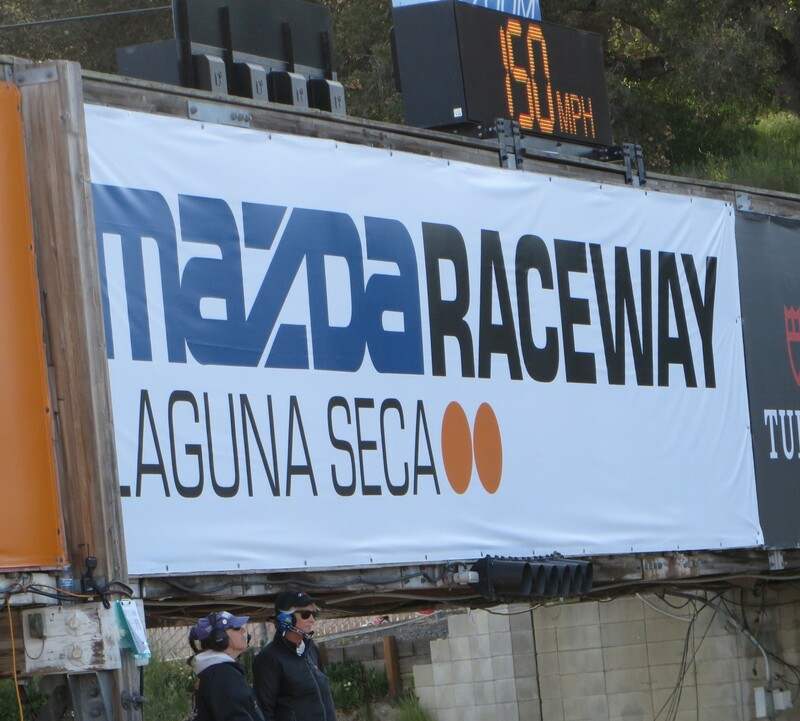 Second and third fastest in class were MICRO SCHULTIS & RENGER van der ZANDE/No.8 Starworks Motorsport ORECA FLM09 Chevrolet and LUIS DIAZ & SEAN RAYHALL/No.25 8Star Motorsports ORECA FLM09 Chevrolet. ANTONIO GARCIA/No.3 Corvette Racing Chevrolet Corvette C7 R/Michelin has the pole for the GT Le Mans class, turning a 1:38.496. Afterwards he was all smiles and happy talk. “The lap was pretty good… right on the limit everywhere. The Corvette C7 worked pretty good and I just hope to carry on the momentum we do have.” His co-driver is Kevin’s father, JAN MAGNUSSEN. Second and third were JOHN EDWARDS/No.56 BMW Team RLL BMW Z4 GTE, with DIRK MULLER, and NICK TANDY/No.911 Porsche North America Porsche 911 RSR Porsche, with RICHARD LIETZ. Edwards was all revved up after his earlier overall victory and in the Grand Sports class of the Continental Tire SportsCar Challenge race. He skipped meeting the press to go back to Pit Lane and get in the car for qualifying. His teammate is DIRK MUELLER. In the large GT Daytona class, SPENCER PUMPELLY/No.45 Flying Lizards Audi R8 LMS was quickest at 1:25.6951. NELSON CANACHE Jr is the co-driver. Second and third in class were LEH KEEN & COOPER MacNEIL/No.22 Alex Job Porsche 911 GT America Porsche, and CHRISTOPHER HAASE & BRYCE MILLER/No.48 Paul Miller Racing Audi R8 LMS Audi. This group was very competitive, with a new leader seemingly every lap or so. 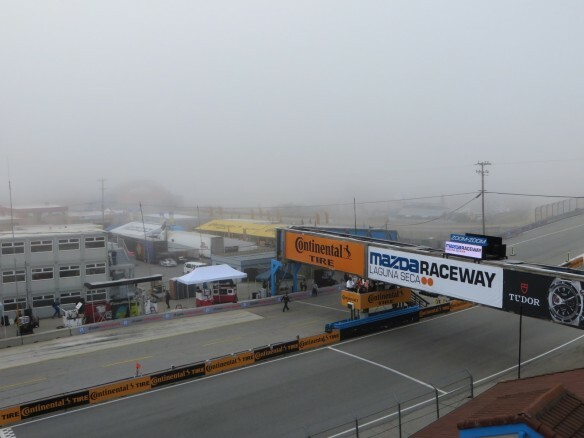 Sunday the four classes will be split into two separate races, with the first one at 10.15am PT for Prototype Challenge and GT Daytona classes, with 30-32 cars. 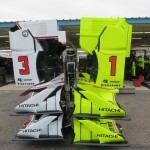 The number depends on two PC ORECA FLMS. 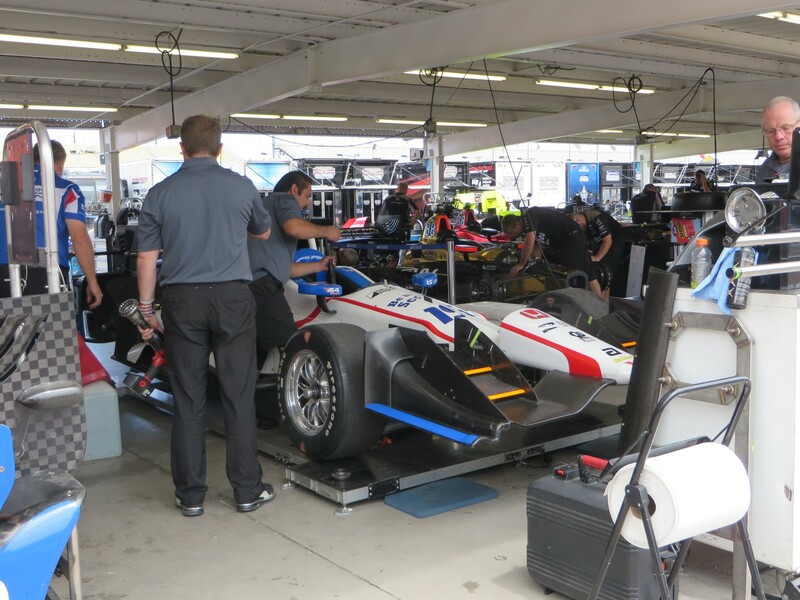 No.88 BAR1 Motorsports has withdrawn, but the Starworks Motorspor car possibly had a wiring harness problem which kept it from qualifying. The team hopes to make the race. 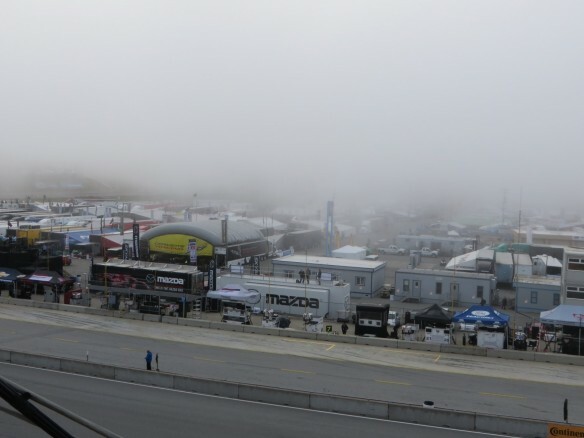 The second race for Prototypes a GT Le Mans will be at 2:45pm PT, with 22 cars. 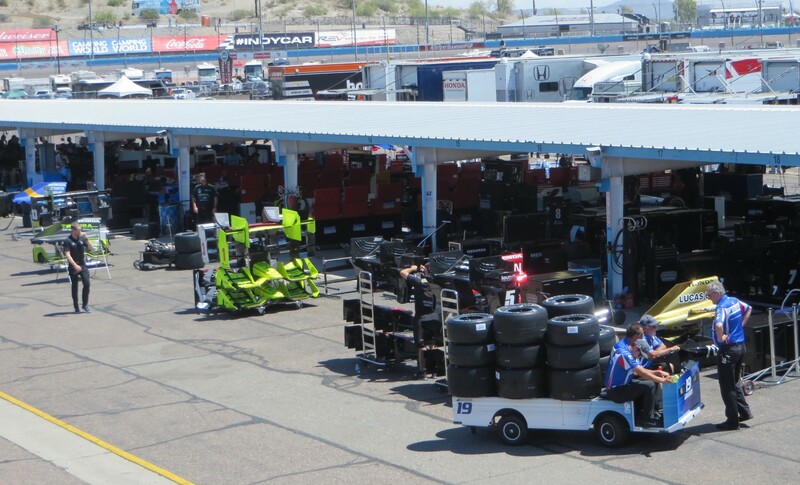 The weather is beautiful at Phoenix International Raceway. It’s sunny, not windy and nary a cloud in the sky. Once it warms up, it will be perfect. Friday’s schedule calls for all three of the NASCAR three top tier series being on track. 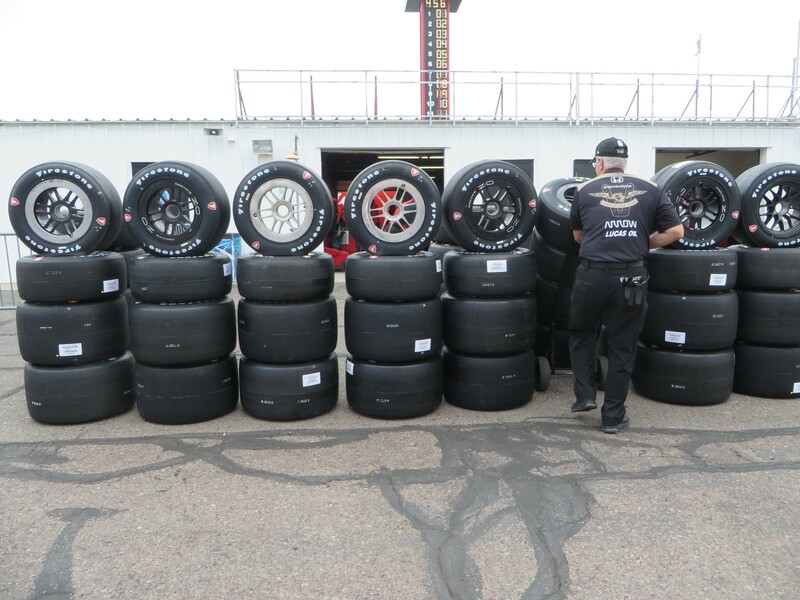 The Nationwide Series has two practices, Craftsman Trucks qualify in the afternoon ahead of its night race, and Sprint Cup has a practice session before its afternoon qualifying session. JOEY LOGANO/No.20 Joe Gibbs Racing Toyota was fastest in the Nationwide 140-minute long morning practice. His speed was 130:724 mph. The young driver will replace TONY STEWART in Sprint Cup next season at Joe Gibbs Racing. Second through fifth were: KEVIN HARVICK/No.2 Kevin Harvick Inc. Chevrolet; DENNY HAMLIN/No.18 Joe Gibbs Racing Toyota; STEVE WALLACE/No.66 Rusty Wallace Racing Chevrolet; and JEFF BURTON/NO.29 Richard Childress Racing Chevrolet. The top Rookie was LANDON CASSILL/No.5 Rick Hendrick Racing Chevrolet, in twenty-fifth place. 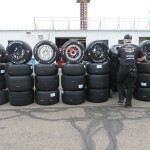 All 50 Nationwide cars were on track. BOBBY EAST cleaned house Thursday night at PIR. He had the pole for both USAC races in the Copper World Classic – Mopar Copper World Class National Midget Championship Series and K & N Silver Crown Series. East won both races. 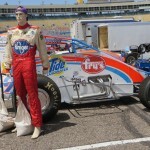 In both cases, young East was racing on the Terry Klatt team. 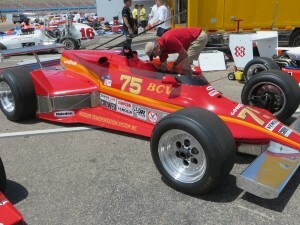 Dad, BOBBY EAST, is a Copper World Classic winner, and he sets up the cars of his making, Beast. In the Silver Crown race, Sprint Cup driver RYAN NEWMAN blew an engine in the unlucky thirteenth lap. It’s been pointed out to me that I committed a non-sequitur in saying “largest-ever Midget field”. I hope you found it amusing. TONY STEWART will be the Grand Marshal for the Fiesta Bowl parade next January. It’s a first for the parade to have a race car driver, and a first for his car to be part of the parade. Stewart has already been warned “There will be no passing.” Friday morning, Stewart was presented with the classic yellow Fiesta Bowl Parade blazer. It made for a colorful photo op over his rumpled orange driving suit. The Fiesta Bowl Parade, which started in 1974, is the largest one-day event in Arizona. Among the varied list of previous Grand Marshals: JERRY RICE, the cast of Hill Street Blues, ERMA BOMBECK, Oakland Athletics, and CHUCK YEAGER. The parade is set for Saturday 3 January 2009. Stewart will also be part of the pre-game festivities and coin toss at the 38th Annual Tostitos Fiesta Bowl on Monday 5 January 2009. 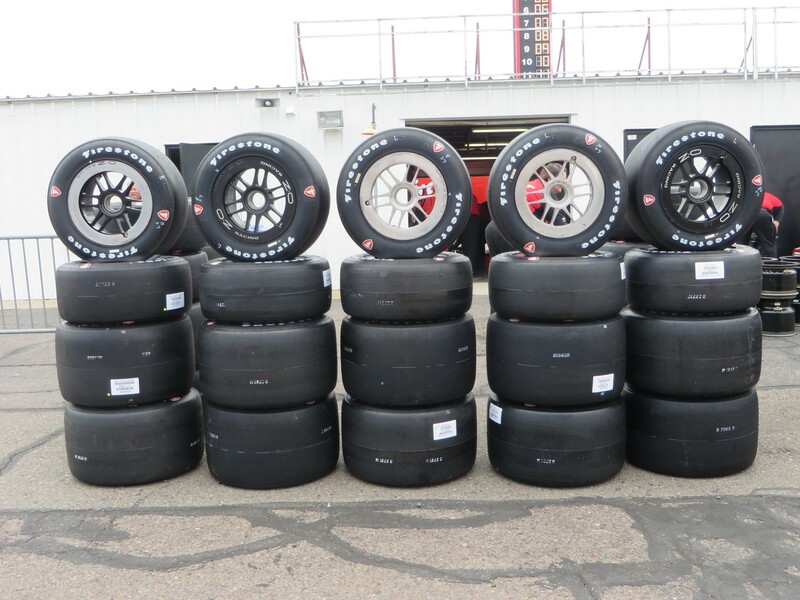 PIR changed this year from being a Pepsi and Miller track to a Coke and Budweiser track. Part of the agreement with the beverage companies is a recycling component for the cans and plastic bottles. 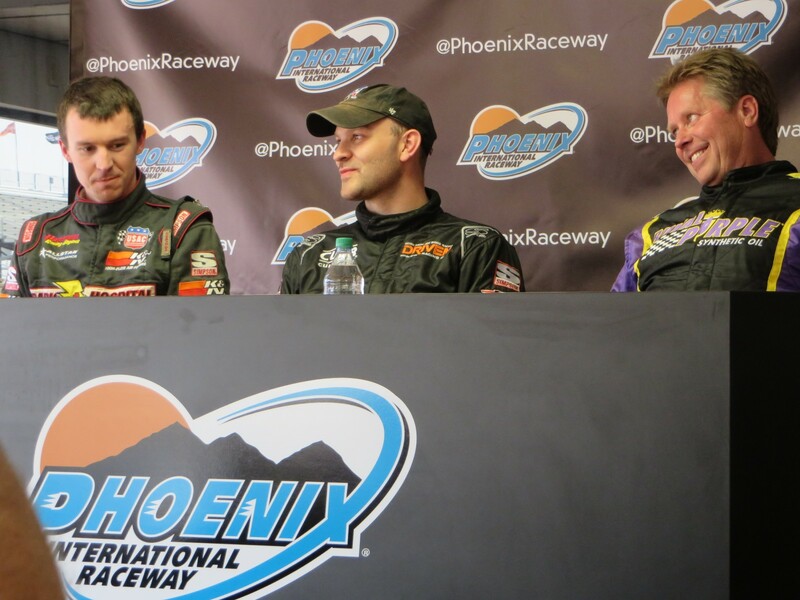 It was a wonderful fall day and night Thursday at Phoenix International Raceway for the first of four days of racing. 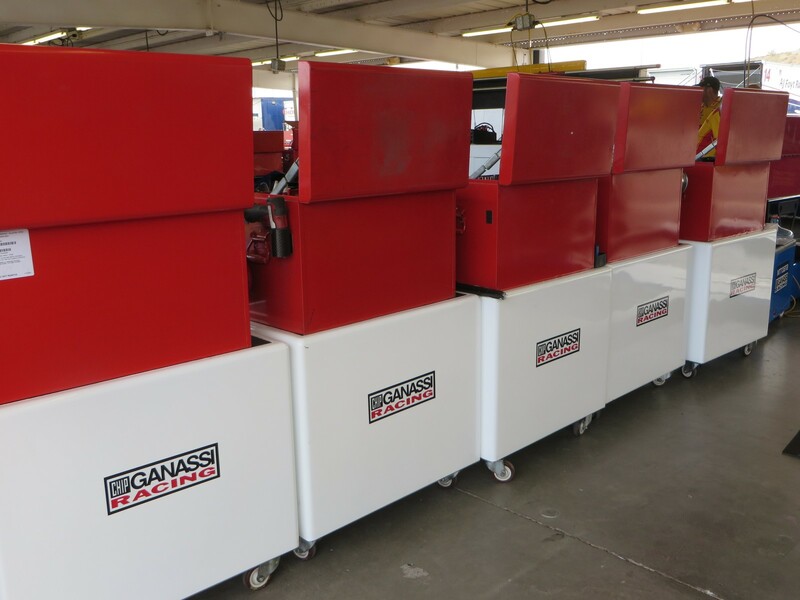 The schedule calls for USAC Midgets and Silver Crown cars in the Copper World Classic, and all three of the NASCAR top tier series – Craftsman Trucks, Nationwide Series, and Sprint Cup. 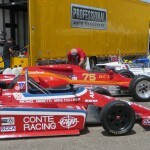 The weather was mild – mid seventies, with not too much wind. In the evening it cooled as it is wont to do in the desert. It promises to be warm and wonderful all weekend. 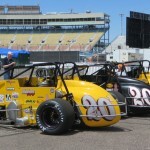 BOBBY EAST had the pole for both Thursday USAC races. His father, BOBBY EAST, is a winner of the Copper World Classic and Junior wants to follow in his steps. 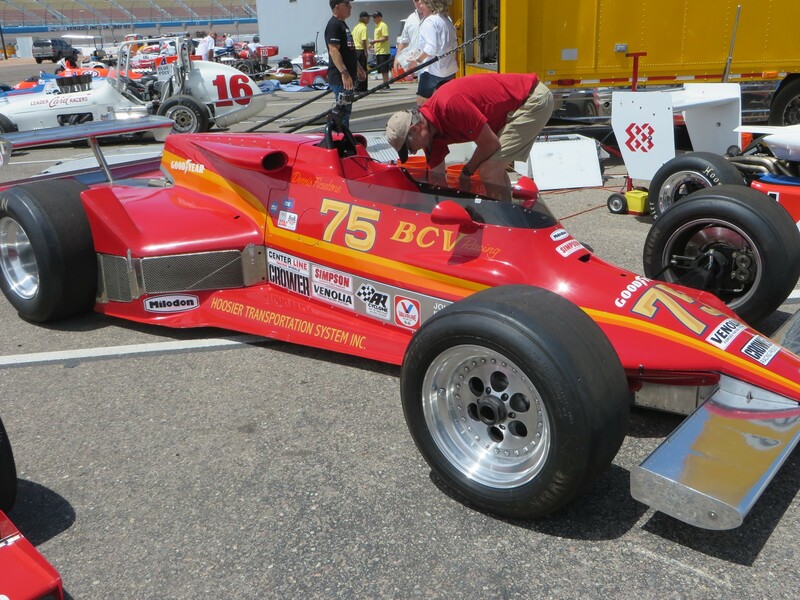 Dad is handling the car setups in – what else – a Beast, with a Ford engine. East won the Midget race, leading start to finish. Kahne finished fourth in the 33-car field. The Truck race has 35 entries, Nationwide has an overflow field of 50 cars, and there are 44 Sprint Cup entries. The Trucks have two races left – PIR and Homestead. At this point, the championship battle is the tightest it’s ever been for the penultimate round. Only six points separate leader JOHNNY BENSON/No.23 Toyota and RON HORNADAY/No.33 Chevrolet. Hornaday has won six times this year, Benson has five wins, and there have been 11 different race winners in 2008. The Trucks and Nationwide Manufacturer’s Championship have already been won by Toyota. In the Cup Manufacturer’s Championship, Chevy leads Ford by two points. Friday both Trucks and Cup qualify and the Trucks have their race at 8 PM local time, televised live on SPEED TV.